“When 79-year-old curmudgeon Raymond (Langella) makes arrangements to be euthanized in Oregon, his family refuses to accept his decision. But when another family emergency arises, Raymond’s daughter Kate (Applegate) turns to her husband Brian (Crudup) for a little help. So Brian reluctantly volunteers to drive the cantankerous Raymond and his wine-loving wife Estelle (Kay Place) three-thousand miles to Oregon. Determined to change the old man’s mind before they reach the Beaver State, it becomes quickly apparent to Brian that convincing your father-in-law to keep living when he’s ready to check out is no simple task.” That is the official description for Youth in Oregon, now available on DVD from Sony Pictures Home Entertainment, which has provided NewTechReview with a NFR copy for review. Although the majority of us won’t find ourselves in this particular situation, almost everyone has to deal with the very trying circumstances of aging family members, in particular, parents. I myself am not quite there yet, but I don’t look forward to the day when my loved ones begin to need constant care for even the most basic of everyday things. In a way, the main character in this film is all too aware of the inevitable and just doesn’t want to face the circumstances of being helpless as well as a burden to others around him. In today’s society, however, euthanization is still a taboo subject and Youth in Oregon tries to dispel that by not really focusing on the subject matter. The problem with the film is that although Raymond is the main character (and really the whole basis for the entire story), Youth in Oregon is more about his dysfunctional family. And there have been so many films that feature stories about dysfunctional families that it’s difficult for this one to stand out. The dysfunctionality of this family isn’t unique either. As usual, it mostly stems from lack of communication between all the family members. The story also includes a troubled teenager, an estranged son (who is also gay), and an angry college-aged son. Add to that Kate and Brian’s strained marriage and Ray’s alcoholic wife and you’ve pretty much got every type of dysfunctional character available. Does this mean that Youth in Oregon is a bad film? Not necessarily. The performances provided by all the actors are excellent, with Frank Langella giving one of his best. If you like this type of story and you’re not tired of seeing yet another dysfunctional family film, then you may enjoy it. There are actually a couple of scenes that I really enjoyed. The first is the very beginning of the movie where Ray is just standing in the bathroom and staring at himself in the mirror. You can almost see him making his decision to die, right then and there. The best scene, however, is when Ray announces to the family (at his birthday dinner, no less) that he wants to die. The reactions from each of the family members are interesting, to say the least. 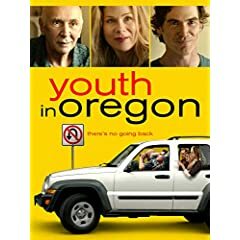 As long as you understand that this film isn’t really about the taboo topic of legal euthanization, and you enjoy stories about dysfunctional families, then you may enjoy Youth in Oregon. The acting is excellent and shines brightly in a few particular scenes. I feel, however, that if the film had focused on the intended subject matter, it could have been much more.